At 9.15pm I realised I hadn't even thought about dinner. I rushed to the kitchen, resolving to make something simple, with as little mess as possible, as quickly as I could, with whatever I had in the fridge. Oeufs en cocotte sans recipe sprang to mind. I don't know where it came from. No recipe involved and I don't recall having ever made it before. I guess I read too many recipe books. Oven to 375 F. Grab two ramekins. A dab of butter in the bottom of each. Followed by a teaspoon of creme fraiche. 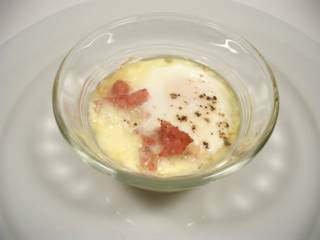 A quarter of a packet of Prosciutto 'scraps' (available from Trader Joes) divided and thrown on top, followed by one egg in each ramekin, topped with freshly ground pepper. An ovenproof dish and the hottest tap water available provided me with a hasty bain marie into which I carefully positioned the ramekins before placing in the oven. I set the table, prepared a green salad with butter lettuce, avocado and a very spicy mustard dressing, opened a bottle Chateau Neuf du Pape to breathe, retrieved a couple of slices of walnut of levain from the freezer and popped them into the toaster. After about 20 minutes, rescued the eggs from the oven. I surprised even myself. At 9.45 we were sitting down to a pretty good and simple meal without the usual mound of dirty pots and pans to looking at us, waiting to be washed up.